Hotel Centre Plaza, Prague. Centre Plaza Hotel Prague. 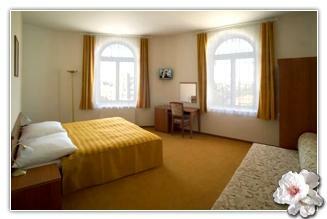 Prague Centre Plaza is a charming 3 star hotel located in an elegant historic building right in the center of Prague. Our guests can have access to all major historical sights by foot, the Wenceslas Square is only 5 minutes away, the Prague Congress Center is only an 8 minute walk away and the I.P. Pavlova underground station and tram and bus stops are a mere 2 minutes away. The main railway station is only 10 minutes away. Our hotel offers 95 charming and spacious rooms which are all equipped with a SAT/LCD-TV, telephone, safe, hair-dryer, bathroom facilities and modern fire prevention features. We offer many well being services as well. For example, our guests can take advantage of our salt cave, a totally innovative way to treat the body and improve your health. We also have traditional relaxing methods such as sauna, whirlpool and massage facilities. Our guests are free to use our pleasant conference hall and our Internet point. Or come relax and unwind in our on-site restaurant and café. Whatever your pleasure, we are sure our guests will find it at our wonderful hotel.